Everything’s coming up Riggle, as along with the rumor that ABC is considering giving him his own Modern Family spinoff, the Farrelly brothers have given him not one, but two roles in the upcoming Dumb And Dumber To. 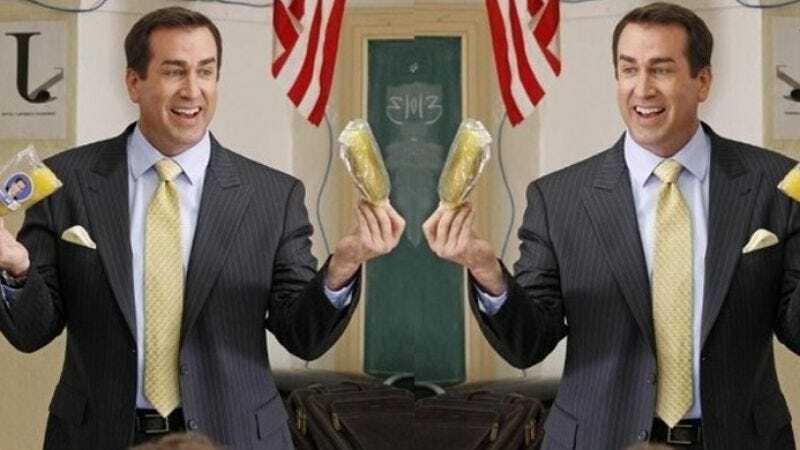 According to The Hollywood Reporter, Riggle will play the part of identical twins Travis and Captain Lippencott—the former a handyman, the latter his “unstable brother”—in the film that now potentially doubles down on the original’s “most annoying sound in the world” with the sound of two Rob Riggles. The Riggle-bros were reportedly among the last major characters to be cast, leaving few remaining surprises to come out of the production—particularly now that it’s already been completely spoiled that Jennifer Lawrence, fulfilling a lifetime of Dumb And Dumber fandom, recently filmed a "secret" role as the younger version of Kathleen Turner’s Fraida Felcher, whom both Harry and Lloyd sleep with. Alas, there's only one of her.